As seen from around the world this Friday evening, the very round and full-looking moon will be a few days shy of full moon. Tonight’s moon will actually be a waning gibbous moon, though it will be so big and bright that you might think it is full. 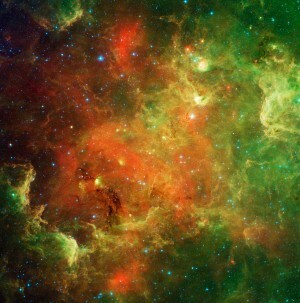 It will be so bright that it will erase most of the stars from the sky. It is possible to use tonight’s moon to locate something with the mind’s eye – something that cannot be seen, even with a telescope. It is the Pioneer 10 spacecraft, launched from Earth on March 3, 1972. Pioneer 10 passed the orbit of the most distant planet in our sun’s family on June 13, 1983. It is now nearing the outer boundary of our solar system. In the not-too-distant future, Pioneer 10 is expected to leave the solar system and enter the realm of interstellar space. When we say that the moon is near Pioneer 10 tonight, what we really mean to say is that the moon and Pioneer 10 are close together as seen on the sky’s dome. In actuality, the moon and the Pioneer 10 spacecraft are nowhere close together in space. They are simply located near each other along our line of sight. The moon lies just over one light-second from Earth, while Pioneer 10 lies over 14 light-hours distant. At present, Pioneer 10 is traveling about one light-hour farther away from the sun every 3 years. That doesn’t sound like much, but remember that light travels at a speed of 186,000 miles per second. 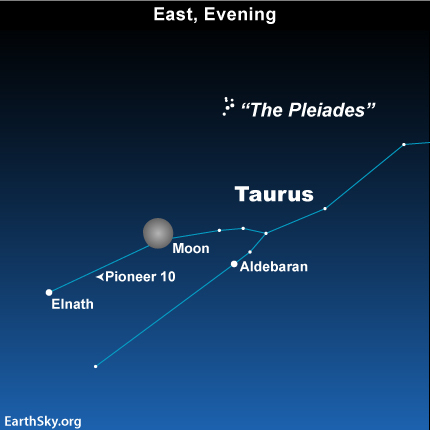 Although the moon will leave the constellation Taurus in a few days, you can continue to envision Pioneer 10 – with the mind’s eye – in between Taurus’ two brightest stars, Aldebaran and Elnath. Site contents copyright © 2019 Recorder Online	except as noted. All rights reserved. | 88 queries in 2.096 seconds.